That will be the toughest round I think... hard to image them attacking the enemy. This round was almost impossible for me to decide. All three entries were great imo. Some of the best creatures yet. Very creative. Fauch claimed first place, barely. Very interesting entry. Asheera as always had a creative entry. 2nd place. Blizard don't feel bad about 3rd place, the competition for this round was tough..real tough. Is this week freeform? Cause i'll be back in if it is. expected to be last. just because a "soul eater" seemed too easy to come with and less original than a giant moskito. Edited by Asheera at 21:08, 22 Jan 2009. Abilities: Grand Web. Cocoon. Frightful Aura. The Spider King is a monstrosity created by the Wizards when attempting to experiment creating a beast-man colossal in power compared to the Minotaur. Needless to say, it got out of control and escaped the city after massacring half of the mages in there. The creature disabled the strong Academy troops such as the Colossi to make possible its escape, by spitting an extremely powerful and tough web and entangling them. 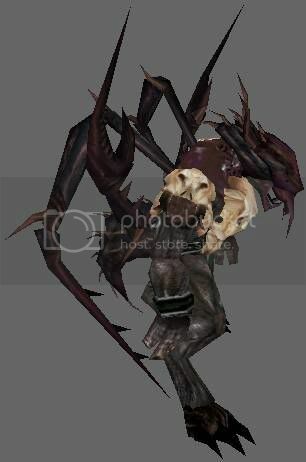 The Spider King is also known to have a special toxin that infects its victims, and after they die with the toxin in them, they spawn some giant and lethal spiders. Now, in the wilderness of Ashan, these monsters have multiplied and have most probably become a part of the ecosystem. That doesn't make them less dangerous though, quite on the contrary. Every traveler who goes in the deep of the wild should be very careful, as an encounter with the Spider King is most probably a certain death. And fleeing is impossible, obviously, because of the web they spit. Cocoon: When this creature damages an enemy creature (non-summoned), it infects the target stack with a special 'cocoon' effect. This effect can be cured with the usual cleansing effects, and is considered a level 3 curse (for the First Aid Tent's dispelling powers). When the stack with the cocoon effect dies, it spawns some spiders. The number of spiders is calculated so that they will have the total power equal to 33% of the dead stack's power. The spiders are new creatures as well, level 2 upgraded, but I won't discuss their abilities... I don't have to, right? Edited by Mytical at 13:06, 24 Jan 2009. Good thing you were not the Judge then huh? Sometimes odd things catch my eye. Other people probably look at some of my judgements and say "What the heck?" but I am a Chaotic person . And no Asheera, you don't have to describe the other spiders. Edited by Fauch at 21:45, 24 Jan 2009. Other people probably look at some of my judgements and say "What the heck?" and also each time I'm 1st. Edited by sith_of_ziost at 02:05, 25 Jan 2009. �Birthed from the tremendous bloodshed of battles, sprites of sheer brutality convalesced into physical forms are dubbed Carnomagi. Seen as dark entities adorned in crimson robes, Carnomagi cause disruptions that shake mortal beings to their core. Seen only in times of peril, they observe battle and scour the remnants of battle. Once created, they hover over corpses, draining their blood to sustain their own bodies. Extremely volatile, few people have parlayed with the Carnomagi and survived. �The Deathlords of Heresh achieved such a feat in Queen Isabel�s War. Upon beginning his entreaties to ensnare the Griffin Queen, Markal, High Lord of Heresh, upon successfully reviving King Nicolai into a vampire, slit the throat of his cousin, Duchess Corina, and called forth those bound to life�s nectar. Appearing first as an ephemeral presence, Markal bargained with the Carnomagi, and as a result, gained their support in the ensuing conflicts that inevitably resulted in his own death. Appearance � A black feature-less body with glazed red eyes robed in scarlet robes consisiting of a mantle, trailing ribbons, full length bottom robe, and a headdress that conceals the mouth. Carries a sinister staff that flows with wispy crimson energy. Bloodlust � Whenever a creature dies in battle, this stack regenerates to full strength. Impale � Attacks by this creature increase in strength when the target is overwhelmed. Consume Corpse � Gains the Demon Lord�s ability to absorb a dead stack and receive mana. bloodlust makes this creature unkillable?? Oh, I should rephrase that. Its supposed to be whenever a creature "stack" dies. Oops. Well not much to this round . Few entries again, guess my long time waiting to judge is killing it? Anyhow..great entries..though I disagreed with some parts..
Sith..yours was ok..but sadly took off points for the bloodlust skill. Not bad exactly, just not to my taste. Does this contest still have participants, and when might the next one be? Edited by Lord_Immortal at 20:25, 26 Apr 2009. Edited by Lord_Immortal at 20:30, 26 Apr 2009.
just wondering what difference can make a cool picture in the final score. 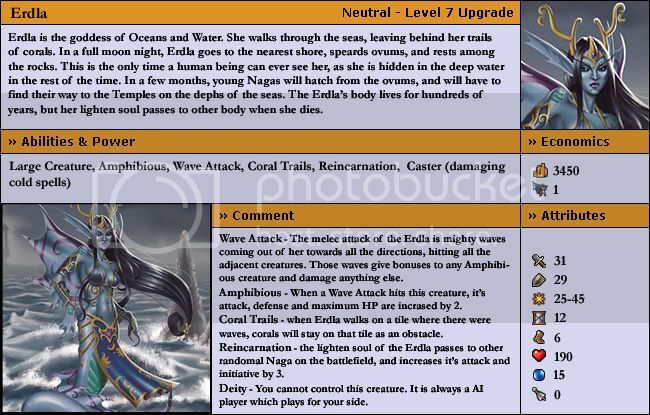 model for Erdla is better.She look nice at the old picture(the picture I liked,that of the woman with tail),besides,what's the meaning if a Godess of the Sea can be a zombie creature!